Sadly, I’ve experienced depression. Even now, I tend to take that slippery slope far too easily. In fact, I spent two years, several years ago, in a severe, debilitating depression that I thought might be the end of me. But because of what the Lord taught me about taking my thoughts captive to Christ, I seem to be more mentally and emotionally healthy now than ever before. I’d like to share the method the Lord taught me in case you or someone you know ever struggles with annoying, discouraging thoughts that seem to spiral down into depression. I call this method “Faith-Lines”. When your thoughts are negative, discouraging, selfish, discontented, or toxic, they are, of course, not based on whatever is “honorable…just…pure…lovely…commendable” (Phil. 4:8). And if thoughts are not life-producing, they might just be…well, harmful. According to Dr. Caroline Leaf, an author, speaker, and notable neuro-scientist, thoughts are real things that take up actual space in your brain. Research shows that healthy thoughts build “dendrites”, little structures that look a bit like microscopic trees that build pathways in the brain. Toxic thoughts, on the other hand, destroy those dendrites, creating empty spaces. So, I’m sure you’ll agree that building dendrites seems like a much more beneficial activity than destroying them! The Lord challenged me, when I was suffering from severe depression (anyone who has battled depression can understand my use of the word “suffering”), to take my thoughts captive to Christ (2 Cor. 10:5). It was a painful process. I felt hopeless, and it seemed as if my prayers bounced off the ceiling. Toxic thoughts seemed to come slithering around me, or to encroach upon me like fog on the floor during a rock concert. My faith in Jesus Christ was intact, but there was blockage on my side of that relationship. But, I persevered, often through tears and anguish. I would speak Scripture promises out loud, thanking the Lord for the truth of them, even though I didn’t feel them at all. I would do this over and over, sometimes moment by moment. 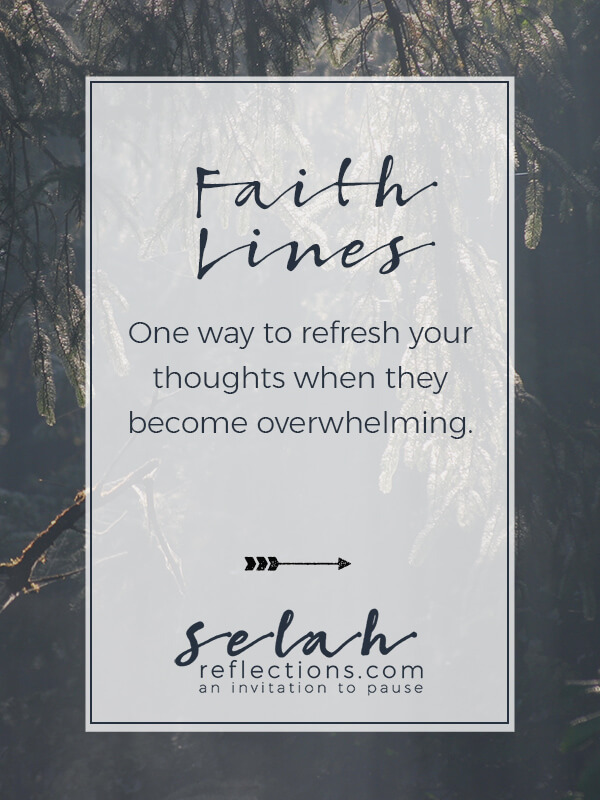 These were my Faith-Lines—emotional, mental, spiritual lifelines, if you will. This was spiritual warfare, and I was wearing the belt of truth, holding the shield of faith, and wielding the Sword of the Spirit (Eph. 6:14 – 18). I would praise the Lord, despite those feelings. I would say through gritted teeth that I believed that His Word is Truth, and that the Truth would set me free (John 17:17, John 8:32). It was slow going. I had gotten myself into that mess by entertaining ever-increasing negative thoughts, and I was climbing, by God’s grace, out of that pit. I sometimes wondered why the process had to be arduous, why He couldn’t just heal me right then and there. I now believe that the Lord wanted to teach me to use that armor, and to persevere, and that He would in this way build my faith. Then, one day, I realized that I hadn’t struggled with the deep, dark, suffocating depression for a week or more. Those negative thoughts still occasionally (or more often than occasionally) come creeping in on almost-silent feet. I can recognize them now, though, and know them to be enemies to my mental, emotional, and spiritual health. I can replace them with life-giving promises from God’s Word, accompanied by praise and thanks, and prayer for wisdom in dealing with whatever challenging situation I might be dealing with. Note: An integral part of Faith-Lines for me was, “ I choose to believe right now, whether I feel like it or not, that…(insert Scripture)”. I needed to choose my thoughts, rather than let negative thoughts infiltrate my mind and take up residence. I needed to believe Scripture based on the fact that God is love and His Word is Truth, not based on my feelings. I usually added some form of the above sentence to my Faith-Lines, and found this to be powerful. May we plant good seeds in the soil of our minds and hearts. May they grow, and bear fruit that we can use to encourage others in their journeys through this lovely, messy thing we call life, as well.